Please see my note about legal restrictions on the models I purchased from turbosquid. I have license to share these models, but you do not and I cannot give it to you. There is an FAQ here. Please read it to see if your question has been answered. 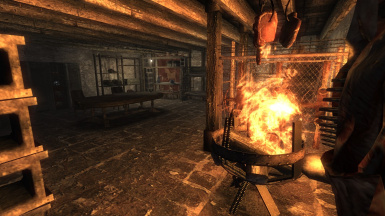 - Introduces a populated Underground, Player Home, and Foundry thanks to Scottmack! - Added a merchant based on the Resident Evil 4 merchant! Go buy something from him! - Adds a little visual treat in the Legate's Camp. This is a taste of better things to come. Known bug - The arms on the black guy in the foundry look like a white guy's. I'll fix this soon. - If you downloaded 1.0 and can't see Gabriel, either download 1.1, or move the contents of meshes/creatures/nvmongrel to meshes/creatures/dog. Sorry for the mix-up. - Nearly all armors have had a texture update thanks to the fantastic work of Weijiesen. The texture updates are not 100% completed, but they are about 80% there. - Gabriel is now available in the Legion underground. Achilles will tell you in dialogue how to get him in your party. Look for the dialogue option under "Can I ask you a question?" - NOTE: Achilles' armor is no longer playable and not available for you to remove from his inventory. If you already have it in YOUR inventory, give it back to Achilles before updating to 1.0. Achilles will give you a playable version of his armor when you get Gabriel back. - The Praetorian and Prime helmets have been updated to remove the "creepy baby doll face" mask. 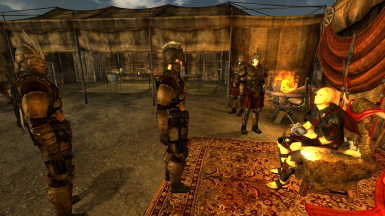 - Vulpes now wears the new Assassin armor in Caesar's tent. The hit squad has not been tampered with in order to avoid interference with other mods. - If, for whatever reason, you prefer the old textures for any armor, I have kept these files in the download. You are welcome to adjust things in GECK or nifskope to suit your liking. - Astor has been upgraded to avoid a premature death at the hands of improved Legionaries. - A few minor clipping issues have been corrected. - A preview of the merchant area I'm working on has been added to the Legion underground. No one is yet there to sell you anything though. - Bugs fixed in the small update include the Prime's face plate and chin strap, the visibility of Silus' and Aurelius' centurion left arm in 1st person, and the guns on the hips of Dead Sea and the the Elites. - Expanded Underground including a merchant, player home, enriched decoration, and improved NPC activity. - Improved Second Battle for Hoover Dam. 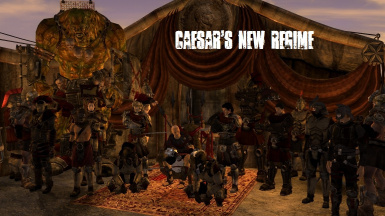 - CaesarInvictus has offered to create a patch for CNR that will include the feature of his mod to recruit Legion soldiers into your party. - Added an optional file to use an explorer with a vanilla male body. So, everyone who does not use Breeze can now have a better experience with this file. The juggernauts may still look a little funny in places, but this is less of an issue and I'm not yet sure the best way to fix it. - Thanks to falloutgods69 for bringing a missing texture to my attention. The brahmin skull pauldron of Caesar's armor and the huntress armor is now working. - Thanks to Joehawks and hownice for pointing out a level-list error with the Legion Assassins. You will no longer fight a Legion hit squad leader in his underwear. - Please note: All fixes from previous patches are included in the newest patch. - Corrects the level list of the Prime Decanus (so the legion assassin leader is no longer in his undies). 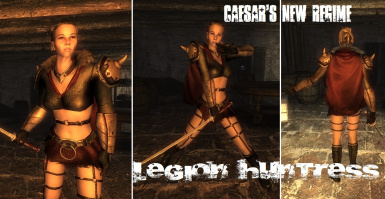 - Adds two variants of the Legion Huntress armor. - Changes Caesar's armor to something much more fierce, yet still royal looking. He also now has a War Chief Helmet in his personal footlocker. These are items more fitting the leader of the Legion. This armor also includes a preview of the texture work Weijiesen has done! - Achilles will now wait properly. I believe that was the last bug with him. - Achilles has all of his dialogue filled in. There may be more to come, but for now he's complete. - The Legion Underground is open, but not much is going on down there yet. You'll need the Legion Safehouse key to get in. The behemoth is caged there too. It's just open so you can poke your head in. I plan to put in a merchant, a player home, more NPCs and decoration, etc. - Achilles will now return home or to the Lucky 38 properly when fired. - The missing facemask mesh for Achilles from the last patch is there now. No more [!] if you remove his helmet. - Hopefully the metal armor is fixed finally. It's been uncannily problematic though. - Achilles tells his story from Cottonwood Cove! It is a 38-line story of uninterrupted dialogue. Don't ask him to tell it to you unless you're ready to listen :)I've written a great deal more dialogue for him to develop the character further, but I wasn't able to record all the voice files just yet. You can read it in GECK though if you're curious. - I've added a DLC-free version of the esp. It's virtually the same file except the armors that point to DLC textures have been replaced with their vanilla counterparts. 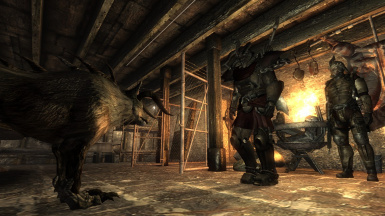 This means the vexillarius wears the wolf head instead of the yao guai, for example. The chains on Achilles' arms will be funky until the next patch though. - Gun Runner's Arsenal and Tribal Pack have been removed as requirements. Upon inspection, I discovered that much of the work I had done in the Legion level lists when I added the katana and broad machete to their arsenal was lost in a GECK crash and never saved. Therefore, everything should work without these masters. 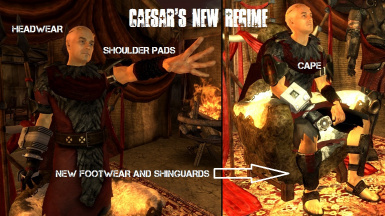 Thank you for checking out Caesar's New Regime! This mod aims to expand and overhaul the Legion into the faction it was meant to be. This is not just for Legion players though!! Not by any means. 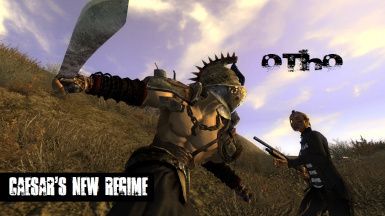 If you're an NCR player, or anyone who kills the Legion, this mod aims to give you better targets. You will feel more accomplished after fighting this Legion; I think an important part of establishing a hero character in a video game is overcoming an enemy that seemed unbeatable. If you're a Legion player, I hope this will make you proud. The best thing though would be if you've never done a Legion playthrough and this mod encourages you to do one. Tell me where you stand! Warning: Achilles uses a single word of profanity.The vanilla game uses profanity much more and much worse so I don't believe it will offend any fans of the game, but I wanted to make you aware. Please remember to ENDORSE!! Thank you! - Scottmack for his work on the Underground and player home. - Flamenx01, InfinityWulf, and everyone else who has reported bugs. The most recent patch has brought us a long way from the initial release, and it's because of their help! - RickerHK for identifying the errors in Achilles that caused his initial bugs with firing and waiting. - Tumbajamba for his resources used for the Centurion Mk. II armor. - Skarmonyx for the behemoth textures. Please note: Skarmonyx did not respond to my request for permission to use his textures. However, he has not been active since June 2011. At that time, he said he was removing all of his mods from the nexus because people were claiming his work as their own on other websites. At the same time, he did not remove his behemoth texture pack. This leads me to believe that he is open to others making use of his textures. 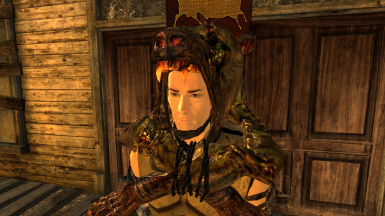 This is further evidenced in the way he allowed OblivionJosh to use his textures in a New Vegas behemoth mod. Skarmonyx's biggest issue seemed to be that others were stealing his work without giving credit. Let me scream it at the top of my lungs: The behemoth wouldn't be possible if not for Skarmonyx! I edited his diffuse texture of the behemoth armor, but otherwise, you have him to thank. I will immediately remove these textures at the request of Skarmonyx, or if a moderator advises me that I have violated nexus policy. I hope it is clear that I am posting this in good faith and aim to enrich the Fallout modding community; furthermore, I would never want to step outside my boundaries and post something against its original author's wishes. 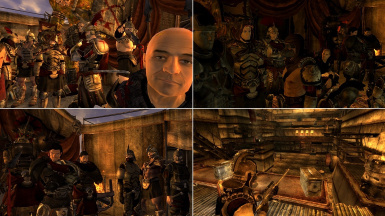 - Please see the included CNRHelmets.jpg if there is any question about my right to use any of the models I included not from New Vegas. Four of the Legion helmets use models I purchased from turbosquid.com along with a standard royalty free license. If I've forgotten anyone or anything else, I'm very sorry and it was not my intent. Please let me know so I can give proper credit. I felt it was important to use some of the work of other authors who have worked on the Legion. Because this is a replacer, I do not want it to render their work obsolete. Also, their work helped provide inspiration for this one, so I want to give them a special nod. 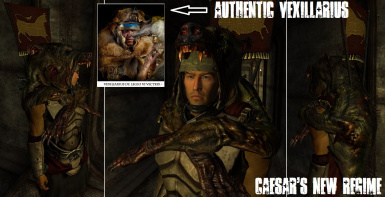 This is why the base armor of Hedszot's overhaul is the basis of the recruit in CNR, CaesarInvictus' metal armor retexture is the armor worn in the Legion arena, KORs' Knight Hunter armor is the Legion explorer, Tumbajamba's resources were used for the centurions, and TG's Legion helmet is the CNR Prime helmet. This mod wouldn't be what it is without their hard work and the help of all authors listed in the credits. 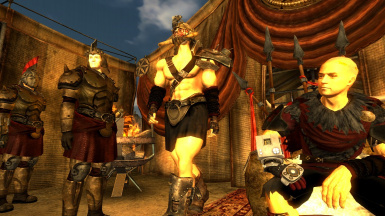 When I played New Vegas for the first time, I was left with the distinct impression that the Legion should have been much more fierce. 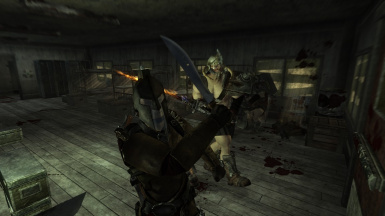 I was able to kill Vulpes and his buddies in Nipton the first time I saw them; I was able to march into the Fort and kill everyone; I was able to kill the Legate with a single headshot. All of these things made them seem like quite weak enemies, and that's before you look at their gear! Let's face it--the Legion just doesn't look tough running around in skirts, football pads, and ugly helmets (with or without the feathers). However, the Legion almost defeated the NCR at the first battle for Hoover Dam, and they've got everyone on the west side of the Colorado scared they'll finish the job the second time. But how? 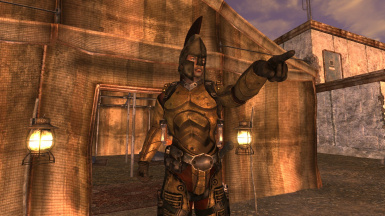 As they are, they're target practice for NCR rangers and snipers. The Legion needed a new look. That's why I created this file. 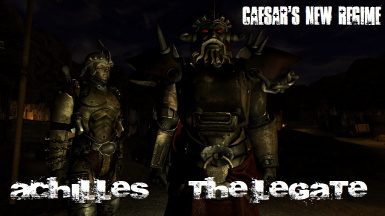 What this mod does: It replaces all vanilla Legion armors, creates a few new classes, edits some weapon lists, adds a voiced companion--Achilles--in the Legion safehouse, alters the faces of some prominent Legion NPCs, turns some Legion NPCs into mini-bosses (Otho, Alexus, Dead Sea), and adds some extra unique gear. 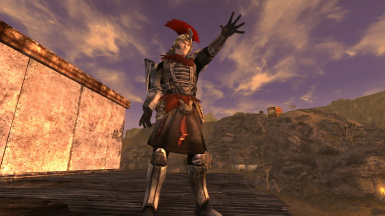 The armors of Aurelius and Silus are now unique, for example. What this mod does not do: It doesn't add many Legion NPCs and it doesn't account for other mods such as AWOP that introduce new Legion classes. - All the old Legion armors are in a dumpster next to the Legion safehouse in case you're feeling nostalgic. 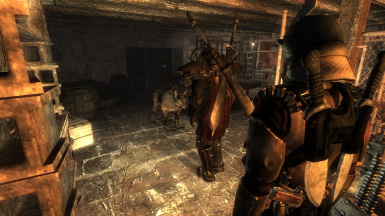 - Inside the safehouse are playable juggernaut armors. They're not lootable from corpses. - If you really want to try on everything, toggle clipping off and walk through the flag upstairs in the Legion safehouse. The floorsafe I dropped everything in for debugging purposes is right there. - There are not yet lip files for Achilles so I've created a non-playable mask for him to wear even if you remove the helmet. I can create lip files, but they're a colossal time hog and I didn't have time for the release of this beta. 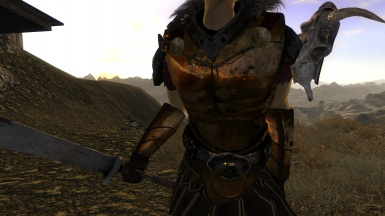 - There are some minor clipping issues with the armors, but these are mostly leftover from the vanilla armors themselves. - The underground area is not complete yet. You can poke your head inside and see what's going on, but it will be greatly expanded. 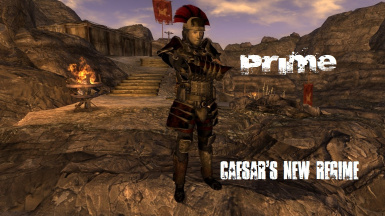 Q: Will this mod conflict with other popular mods like Project Nevada, Lings, or Fallout Redesigned? 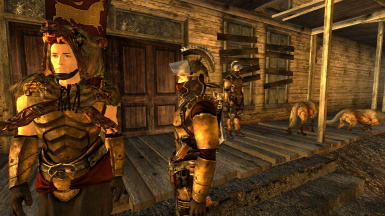 A: The visor overlays of Project Nevada correspond to the old helmets so there isn't complete consistency in that regard, but there is no real conflict in gameplay. Fallout Redesigned mostly affects other NPCs than the ones changed in this mod. Some have reported difficulty running this mod with Lings though. Flamenx01 has reported that loading CNR after Lings in your load order can fix things. If not, you can PM him for instruction on another way to resolve Lings compatibility issues. Q: Is that a behemoth in the main picture? A: Yes it sure is. He is found caged in the Legion underground. 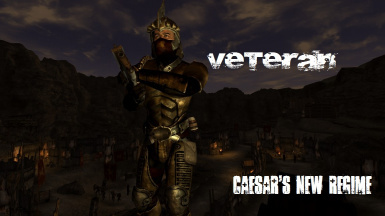 Hopefully when this mod moves to 1.0, he will be found storming the Dam at the Second Battle for Hoover Dam. Q: Will this mod conflict with your Legion Power Armor mod? A: There were two parts to that mod. The first is that of the Legion Power Armor itself. I didn't touch that. It's still in the same unmoved crate in the safehouse, even though everything else has moved around it. For the small replacer files in the Legion Power Armor, yes, this mod should negate those changes in favor of the new and improved CNR armors. I suggest just not using that esp at all. Q: Will you do other factions too? 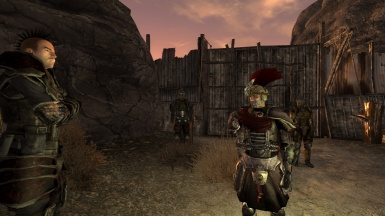 Longer answer--Part of the reason this file exists is that the Legion was sorely neglected in the vanilla game's development (no disrespect to Obsidian because New Vegas is by far my favorite game of all time) and in the mods that have been created to this point. I believe ADAM and NCR Rearmament are great mods that do a very nice job overhauling the NCR. I recommend them! As for the other factions, the BoS has many mods already; Mr. House doesn't need an overhaul (though the securitrons could look cooler, I admit), and the rest of the factions are just fine too. Sure, the Boomers and Khans might look better with a nice overhaul, but I don't think their factions have enough depth to warrant the time this overhaul took. A: I'm helping with Project Brazil. Q: Don't you know the Legion is a bunch of brainless tribal savages who could have never made the armors you gave them? This mod is very anti-lore! A: That may or may not be true. First and foremost, New Vegas and all Fallout lore is fictional. If you want to find a way to reconcile things in your mind, or if you want to find conflict, you will be able to do so. On that note, it should be pointed out that the vanilla lore is internally inconsistent. 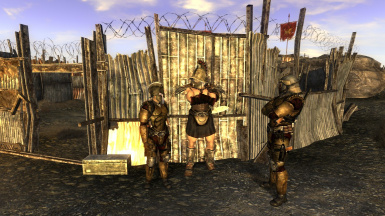 Sure, Fallout lore contends that the Legion is a slave army and that Caesar forbids many technologies, etc etc. But Fallout lore also contends that the Legion are fierce, dangerous, numerous, organized, and a grave threat to the NCR and Mr. House. None of these things seem especially true in the vanilla game. 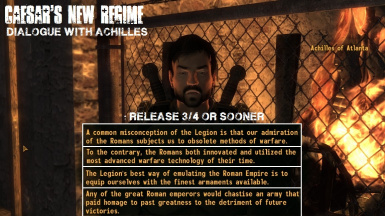 Also, consider these facts: The Legion safehouse contains a sniper rifle, displacer glove, and Atticus never runs out of stealth boys; Legionaires at the Dam War are equipped with super sledges, marskman carbines, and anti-materiel rifles; in the Fort, the praetorians are equipped with ballistic fists and Caesar has a power helmet in his personal footlocker. Does all this make sense with a faction that is wholly anti-tech? In a sense, you can pick which Legion you want to see in your game: Tribal sniper fodder with repurposed sports gear, skirts, and spears or a hardened group of soldiers ready to fix their mistakes from the first Battle at Hoover Dam. Q: Love the new armours! Can you remove the faction status script? A: Already done! It is worth noting that the faction status scripts have instead been applied to the helmets and removed from the armours. This always made more sense to me. If you've got a reputation with a certain faction, the only way they're going to mistake you for a member of another faction is if they can't see your face! Q: Will you add quests? A: I'd really, really like to. I have to learn how first though :) If you're a modder who can create quests and want to work with me in this area, please PM me. 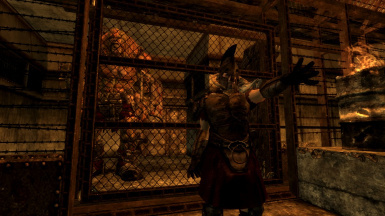 Q: Why is the vendor in the Underground based on the Resident Evil 4 merchant? A: When it comes to a Legion vendor, it seems there should be no one to sell Legion armor. That gear would be issued only and unavailable for purchase. The Legion would just take whatever someone else would buy with caps anyway. So, rather than another dull Dale Barton, I picked a favorite character of mine from another one of my favorite games. The RE4 merchant could always find a way to get to you in that game, so what's stopping him from finding the Courier (other than a few hundred years)? This serves no real lore purpose, but it's not as if it's exactly anti-lore either. This decision was really just a personal touch of mine because I like the character. This files requires you to own Dead Money, Honest Hearts, and Lonesome Road. If you don't have these, activate the CNR_BetaNODLC.esp instead of the other. Also, for the male bodies, you will need Breeze's male body replacer. It's worth the download if you don't have it already. If you don't use it, the exposed portions of skin on the explorer and juggernauts will look funky. I'm looking into patches for those of you who uses Roberts or vanilla bodies. This mod will conflict with some other mods that alter NPCs such as Lings. Just make sure to adjust your load order properly and use FNVedit to make a merged patch if necessary. - All textures are finalized. Weijiesen is still working to improve the textures I've created. He's a master at what he does, so expect the visuals of this mod to improve greatly. - All level lists finalized. - Multiple reports from users that the file seems big-free. - Finish the Legion Underground including a player home and Legion training facility. Then, in future updates, I would like to expand the Fort, edit the Dam Battle, and add another companion--a modified mongrel. 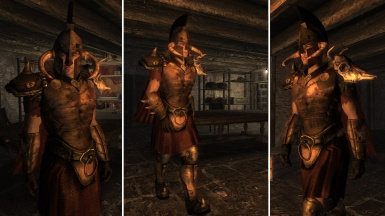 Perhaps I can create a few more unique centurion armors and create a special class and armor for the Legion assassins that come after you when you're vilified by the Legion. - NCR Rearmament: Install before ADAM so that this file overwrites vanilla files, then ADAM can overwrite anything from here. 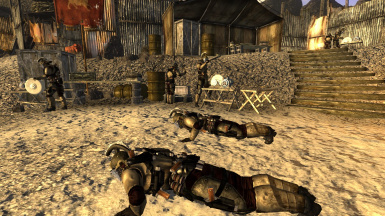 - Fort Meridius: A great Legion camp near Vault 19. This may be incorporated into CNR. The author is helping with the Legion Underground. 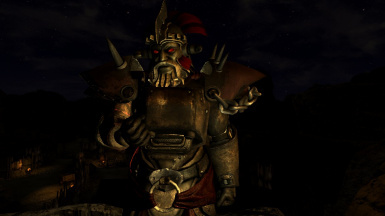 - Legion Power Armor=: My first mod and still the most endorsed Legion-themed mod on the nexus. Don't bother with the replacer esp though. Any original work I've done is free to use. However, you cannot use the models for the recruit helmet, Otho's helmet, the spartan helmet used for Dead Sea and Severus, or the Elite helmet. These are models that I purchased. I own the right to share them here, however, you do not own the right to redistribute them. I also don't have the right to grant you permission to use them, so don't bother asking. The rest of the mods I utilized resources from were all posted with open permissions. So just let the authors know you appreciate their work.